9 May 2014, 10:00 - 17:00, Fraunhofer Forum, Berlin. This practical workshop provides tutorials to learn how new Smart Mobility solutions can be developed and an assessment can be done. All workshop participants get a ready-to-use simulation environment for their laptops to carry out all tutorials themselves. In the first tutorial, sophisticated simulation scenarios will be created. 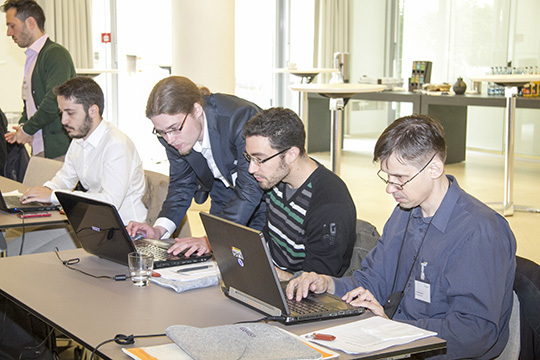 Then, the participants learn to set-up simulations and to develop own mobile applications. In the third part, the participants will become familiar with comfortable assessment tools and learn how they can analyse their simulation results. New smart connected applications help to increase today's mobility: Traffic participants have the opportunity to exchange a huge amount of information via cellular and Vehicle-2-X networks. Smartphone and in-vehicle apps use the received information to suggest optimized travel routes and to increase safety of all traffic participants. 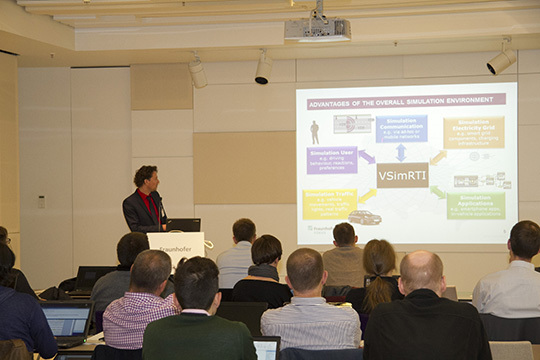 VSimRTI is a comprehensive simulation framework for the assessment of new solutions for Intelligent Transportation Systems. Therefore, VSimRTI integrates various simulators responsible for vehicular traffic, communication via cellular and Vehicle-2-X networks, smartphone and in-vehicle applications, and electric mobility. The dinner will take place on the eve of the workshop, 8 May 2014, at 19:00 in the restaurant Schneeweiß (about 10 minutes by taxi or 20 minutes by public transport from Berlin-Alexanderplatz). 11:00How to create a simulation scenario? 13:30How to simulate mobility solutions? 15:00How to evaluate simulation results? 16:00How to develop mobility applications?